For our three year wedding anniversary this past December, we spent ten romantic days at the Sheraton Keauhou Bay Resort & Spa. The sole Starwood property on the Big Island of Hawaii, this large resort sits on a dramatic lava flow over looking the Pacific Ocean. Nestled on twenty-two acres of immaculately manicured grounds, Sheraton Keauhou has over five hundred guest rooms with private lanais and Hawaiian style furnishings. 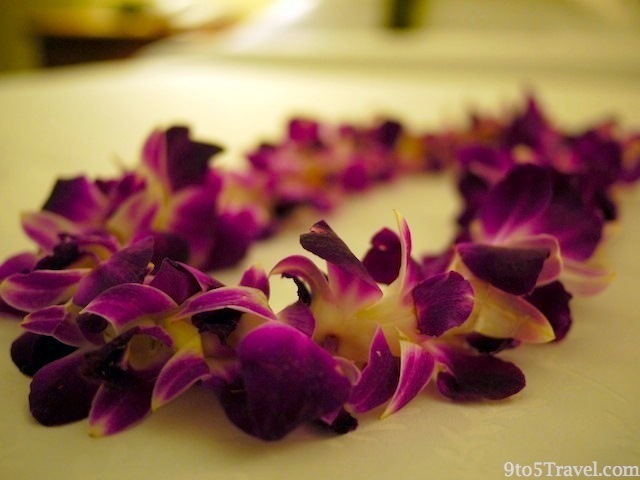 Upon check-in, we took in the panoramic view of Keauhou Bay while replenishing after our flight with refreshing citrus and mint cucumber infused water offered in the resort’s open lobby, and were greeted with a warm aloha welcome of fresh orchid Hawaiian leis. As SPG Gold members, we were upgraded to huge king ocean view room, perched right over the water. 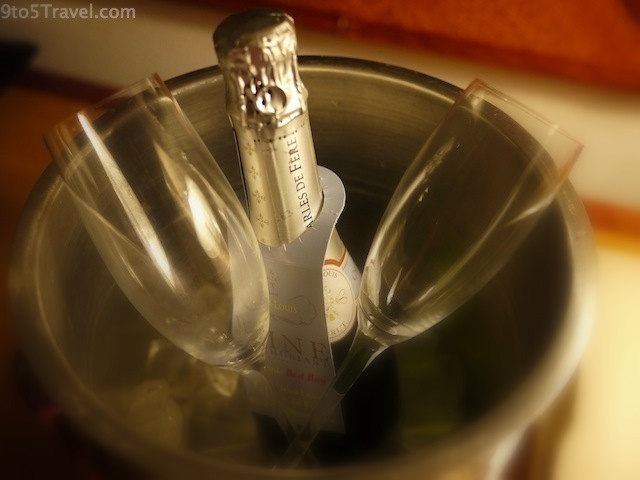 At night, we enjoyed ideal views of graceful manta rays from our private lanai while enjoying a bottle of champagne gifted to us from the Sheraton to celebrate our anniversary. A choice of three restaurants, including a formal restaurant, poolside eatery, casual bar & grill, Kona coffee shop, and a weekly luau mean Sheraton Keauhou Bay Resort & Spa has plenty of dining options to choose from. We were hosted at Kai for dinner one evening (read our review here), enjoyed Keauhou Bay Coffee Company’s 100% Kona estate coffee (review here), and were also hosted at the fantastic Haleo Luau Dinner & Show (read our full review here). Plenty of activities are available to be experienced at the Sheraton Keauhou Bay Resort & Spa. Enjoy tennis, basketball or sand volleyball at the provided courts, or play a round of golf at the adjacent Kona Country Club. Sheraton Keauhou’s complimentary 24 Fitness Center showcases a lovely ocean view while working-out. We soaked up the sun and drank mai-tais by the resort’s large outdoor swimming pool, unequaled in Hawaii: A river system connects the multi-level system of pools leading a to a waterfall and transitions to a 200-foot-long lava tube waterslide! Feel like something exceptionally relaxing? The Sheraton’s on-site Ho’ola Spa offers a range of treatment options, which we tried one here. An exclusive SPG lounge, equipped with computers, printers and a fridge fully stocked with premium Hawaiian bottled water is provided at lobby level for Starwood Preferred Guest members. This lounge came in handy when utilizing our airline’s online check-in feature and printing our boarding passes on the day of our departure from the Big Island of Hawaii. FYI: The resort recently began a multi-million dollar renewal with upgrades scheduled to be completed by June 1, 2012.